The following is paraphrased from: "Boudreau or Beaudreau" by Rev. Dennis W. Boudreau in AGE. 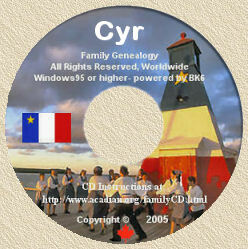 One of the children of Mathurin JOUSSET dit LA LOIRE and Catherine LOTHIER, Jean Baptiste JOUSSET dit LA LOIRE, b. c1667 in Montreal, was a recruit of d'Iberville for the Gulf Coast Expedition of 1699. He married Marie Anne NADEAU (b c1699). Their son, Claude JOUSSET dit LA LOIRE, was the first "official" French male child born in the Colony of Louisiana in 1705. Another child, Jean LE CAMP, was born prior to Claude, according to Bienville's journals, but he died before the age of 2. Claude filed a suit in New Orleans in 1726 claiming that he was the first male child born in the colony. He was after a stipend offered by the King of France. In 1731 the Superior Council, based on "first-hand" testimony, awarded the stipend to Claude's father, posthumously. In the mid-1700's Claude was brought to court for stealing a widow's chickens in New Orleans.